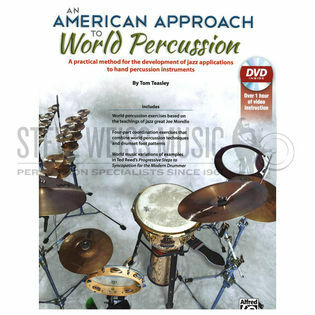 Tom Teasley's An American Approach to World Percussion offers Western-trained percussionists a systematic approach from which to draw on their experience as drumset players and rudimental performers, and apply that knowledge to a variety of world percussion instruments. Applications for djembe, doumbek, tambourines, shakers and more are combined, often with four-part coordination. In addition, techniques are frequently interchanged among instruments to demonstrate the commonality of approaches. While this is not a substitute for traditional study of these instruments, An American Approach to World Percussion is a comprehensive study of world percussion from an American jazz perspective. It should also broaden the horizons of those already familiar with traditional applications of these instruments by offering a jazz sensibility. Above all, the student is encouraged to use this material to ignite their own imagination to develop a personal connection with the vast world of world music. Includes over one hour of video instruction. One of the many fascinating things about world percussion is that all of the techniques and skills translate to the other types of percussion. 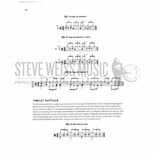 Practicing the many exercises included will not only develop a solid base for technical playing but also an even greater sense of beautiful tone that will mature students of all levels as musicians. Taking it one step further, Mr. Teasley combines elements of various styles of percussion in his approach to teaching world percussion. Serving as both a musical and technical guide, An American Approach to World Percussion is a must have for all percussionists.